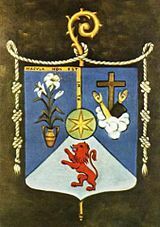 The Order of the Immaculate Conception (Ordo Inmaculatae Conceptionis), also known as the Conceptionists, are a contemplative religious order of nuns. For some years, they followed the Poor Clares Rule, but in 1511 were recognized as a separate Catholic religious order, taking a new Rule and the name of Order of Immaculate Conception. Founded in 1484 at Toledo, Spain, by Saint Beatrice of Silva, a noblewoman of Portugal and sister of the Franciscan friar, Blessed Amadeus. On the marriage of Princess Isabel of Portugal with King John II of Castile, Beatrice had accompanied the future Queen, her cousin, to the court of her new husband. After the marriage, however, her great beauty aroused the jealousy of the Queen, for which she was imprisoned. During that time of incarceration, Beatrice experienced an apparition of the Blessed Virgin Mary, telling her that the Blessed Mother wanted her to found a new Order in her honor. Beatrice escaped with difficulty and took refuge in the Dominican Second Order monastery at Toledo. There, for thirty-seven years, she led a life of holiness, however without becoming a member of that Order. In 1484, Beatrice, with some companions, took possession of a monastery in Toledo (now the Monastery of the Order of the Immaculate Conception) set apart for them by Queen Isabel, the Catholic. 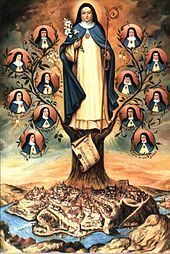 The Order of the Immaculate Conception was founded by Saint Beatrice of Silva. In 1489, by permission of Pope Innocent VIII, the nuns adopted the Cistercian Rule, bound themselves to the daily recitation of the Divine Office of the Immaculate Conception, and were placed under obedience to the Ordinary of the diocese. In 1501, Pope Alexander VI united this community with the Benedictine community of San Pedro de las Duenas, under the Rule of St. Clare, but in 1511 Julius II gave it a Rule of its own and put them under the protection of General Minister of Friars Minor, for this reason the nuns are called Franciscan Conceptionist. Special constitutions were drawn up for the Order in 1516 by Cardinal Francis Quiñones. 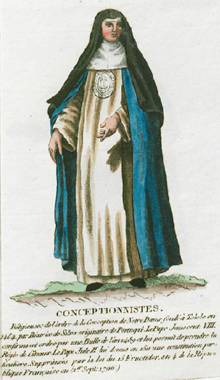 It was the foundress, Beatrice of Silva, who chose the habit: white, with a white scapular and blue mantle. The foundress, Mother Beatrice of Silva was canonized by Pope Paul VI in 1976. Her feast day is 17 August. A major change in the interior life and spiritual orientation of the Order developed at the end of the 20th century. The Second Vatican Council had instructed all religious institutes to go back to the inspirations and goals of their founders and to make sure that their current orientation and lifestyles of the communities were in keeping with these. Through the studies done by Mother Mercedes de Jesús Egido y Izquierdo (1935–2004), a new direction was developed and tried on an experimental basis at her monastery. After a trial of two years, new Constitutions were drawn up out the experience, which were submitted to Rome and approved by the Holy See in 1996 for this Order, removing from it the noticeable Franciscan influence imposed upon it by the papacy. Mother Mercedes successfully argued that the Foundress vision was that of a life lived in imitation of the virtues of the Blessed Virgin Mary. She has become seen as a second foundress through her efforts. The process for seeking Mother Mercedes canonization was formally opened at the Monastery of the Immaculate Conception and St. Beatrice in Toledo on November 8, 2011. In August 2018, a traditional Conceptionist order in Brazil, known as the Congregation of the Poor Brothers of the Immaculate Heart of Mary, announced that after "too much study of the unfortunate situation that the Holy Mother Church is in," that they now accept sedevacantism, the belief that there has been no pope since the death of Pope Pius XII in 1958. ^ Friar Gabriel of Our Lady of Sorrows, CIPICM. "Epistle Tombo" (PDF). †Congregação dos Irmãos Pobres do Imaculado Coração de Maria†. Retrieved 1 September 2018.